My friend and I had a fantastic experience in this RV. It was our first time renting an RV and Glenn was so great to communicate with and always got back to me in a timely manner. He even sent me videos to help us get prepared for the trip and get a better understanding of the vehicle. 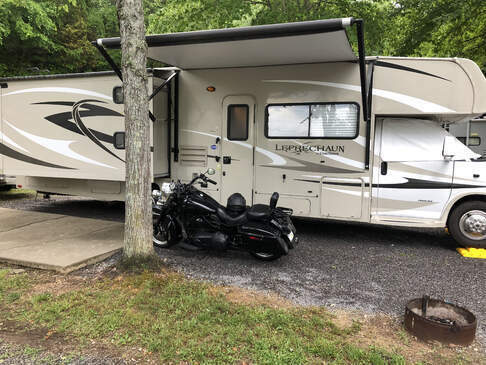 The RV is very well appointed and has everything you could possibly need to cook great meals, escape from the sun under the canopy awning, lounge in the chairs that are provided, or cook outside on a grill. The beds were also very comfortable and the RV was exceptionally clean and new! I would highly recommend renting this RV. Brand new RV. Sleeps 6 and is ready to go. Daily rental cost includes linens and towels, basic kitchen equipment (plates pots pans etc) and 4 camp chairs and habachi. It has 3 slide outs. Gas range and oven. Separate shower and bathroom. Also has fridge and freezer. Private master bedroom with queen bed. It has gas furnace when it gets chilly. Also has AC in the cab and the rear coach. Has TV and DVD player as well as antenna for TV signals. 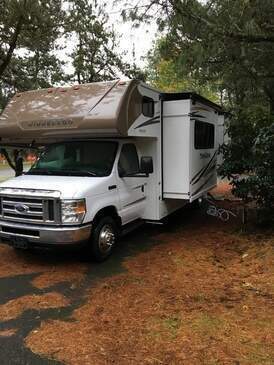 This RV is so much fun and the perfect size to go most anywhere including all state parks but still provide plenty of space for comfort and fun. 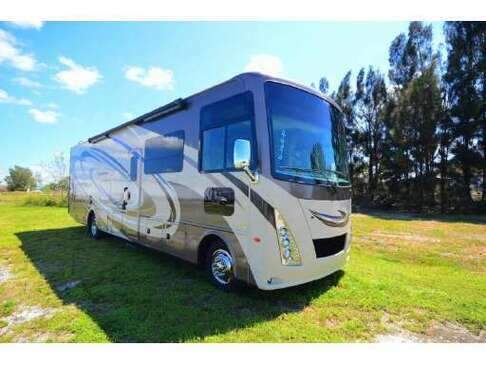 Best Deal on a Luxury and Budget Friendly RV rental! This is a true luxury RV. It's called the Champagne Edition for a reason! 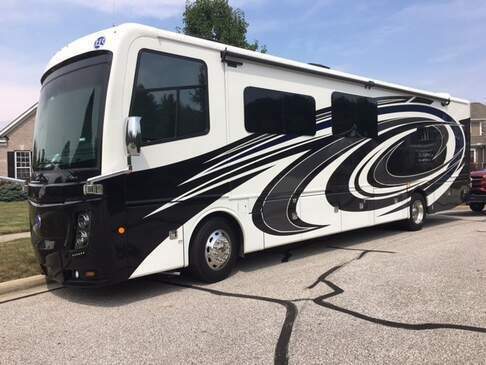 This RV is well cared for, loaded with upgrades and is absolutely perfect for family vacations, special events, NASCAR races at TMS, Will Rogers events or whatever you've got planned! You will not be disappointed! I provide pretty much everything you will need for a care free vacation. Tow Vehicle must be 3/4 or 1 ton if traveling more than 100 miles from Fort Worth (i.e. 250, 2500, 350, 3500). 1/2 ton tow vehicle is acceptable if traveling less than 100 miles but 3/4 ton or 1 ton is still recommended. I supply the trailer hitch and sway control system so you'll have a safe towing experience. If you don't have the right tow vehicle or just don't feel comfortable pulling an RV then I offer delivery and pickup within 100 miles of Fort Worth for an additional charge. Please contact me for more details, rates and available dates/times for delivery. 99% of the time...I can make it happen! If you're looking for the space of a Class A but with the easy of driving of a Class C, look no further! Save money on having to eat out all the time while vacationing and enjoy gorgeous accommodations better than most hotels. 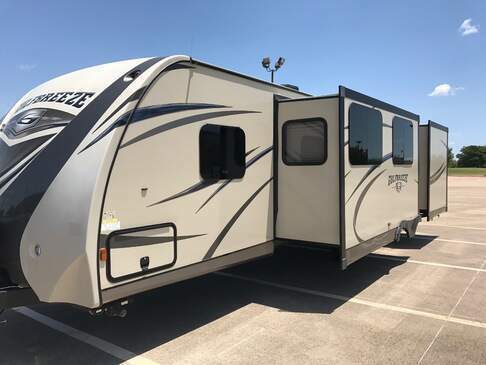 Room for the entire family with bunk house, two slides, automatic awning, outdoor entertainment center, entertainment center for bunk beds, TV for main living room and much more. The Coachmen class C drives as smooth as a van, making the journey as enjoyable as the destination. The Leprechaun has side cameras that activate when you engage the turn signals. Has 1 Queen Bed, 2 twin beds, 3 full. Included: Paper plates,cups,plastic-ware,bed linens, pillows, pots/pans,towels/washcloths, coffee maker, toaster. LOW MILEAGE and in very nice and clean condition. Enjoy your RV trip in a Winnebago View. It’s a Dodge Sprinter chassis with a Mercedes turbo-diesel motor, making for a great combination. It has large windows for greater visibility, its very roomy and comfortable with lots of headroom.There are three options for sleeping in full size beds, one overhead via a ladder; one as the sofa folds down; and lastly the dining room table drops down and coverts. There's an HDTV with DVD for your use, a back up camera and nice sound system. Stocked with dishes, silverware, towels, bed sheets, a coffee maker and a couple of camp chairs. Complete inventory list available. Can supply bike rack or carrier - you just need to bring your pillow(s), your bedding, your DVD collection and a deck of cards. For RV newcomers, complete instructions on all operational components and my cell phone number for contact if you have further questions during your RV trip. Look forward to helping you enjoy your RV experience and many thanks. No on the beach access, beach driving, beach camping or otherwise allowed with this RV. 2017 Holiday Rambler Endeavor XE 38K DIESEL Pusher - Less Than a Year Old! Includes all dishes, pots, pans, cooking utensils, silverware, knives, glasses, toaster oven, containers, measuring cups, cleaning supplies, Keurig coffee maker, paper towels, foil, Ziploc bags, napkins, salt, pepper, toilet paper, paper plates. Coach's diesel, DEF, water and propane tank will be full when you pick up the vehicle. You are expected to bring the coach back with all the tanks refilled to capacity. If you forget to top these off, we will charge you for us to top them off plus a $50.00 service charge. You are also expected to dump the gray and black holding tanks before return, but we do understand that this is not always possible. Because we understand you may "forget" to dump the tanks we will do it for you at $75 charge. We do allow towing with our motorhome, as long as the item towed is less than 6,000 lbs. Note we also rent our car hauler trailer for your convenience, and will deliver the coach with it already hooked up. Absolutely no smoking inside of vehicle. Smoking inside of vehicle will result in complete forfeiture of deposit to cover cost of smoke removal from vehicle as we have a very allergic child. Small dogs (under 15 lbs) may be allowed on a case-by-case basis. This is a really luxurious coach and we leave our shoes just inside the door before we enter it to preserve the beautiful ceramic tile floors and carpeted areas. We would appreciate if you would do the same. Must be a minimum of 25 years of age with a valid drivers license and with previous large vehicle driving experience, BUT don't let that stop you if you are interested,WE WILL ALSO DELIVER AND SET UP FOR AN ADDITIONAL FEE WITHIN A 200 MILE RADIUS; CHARGES WILL BE CALCULATED BASED UPON LOCATION, TIME AND EXPENSES INCURRED, CONTACT US FOR A QUOTE). 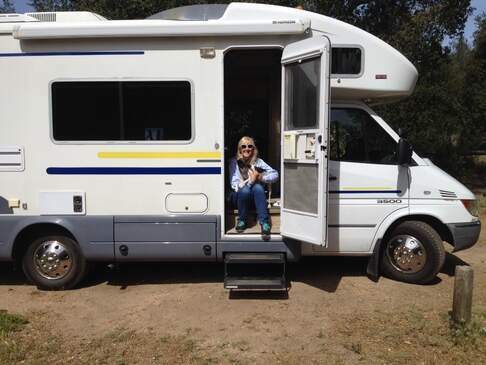 All the comforts of home, sleeps 4 comfortably, Hope you will enjoy this like new Class A motor home as much as we do. It has a comfortable queen size memory foam mattress and a sofa that makes into a bed. Easy to park and set up with self leveling.Good quality amenities!!! * Kitchen stocked with paper plates, pots and pans. 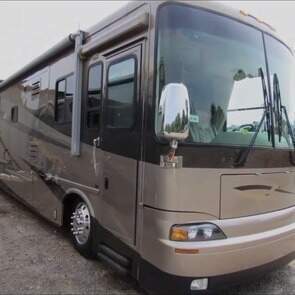 ***storage for your personal vehicle in a gated facility, where the RV is located, can be arranged for no charge***This like-new luxury Thor (Airstream) Windsport is loaded with features. She'll fit 6 adults without a problem! The bedroom, with walk around queen-size, comfortable bed, sports its own flat screen. Netflix is included! You'll have to bring the chill. As you enter amidships, plenty of interior lighting and loads of windows both big and small make for a very open experience. The large dining space in its own slideout is nicely set-off with all-maple cabinetry. For sleeping arrangements, the dining booth and leather sofa both fold out to comfortable queen-size beds. The two very large slides add a great deal of living space. The master is large, with loads of cabinetry and closet space.Large refrigerator and freezer operate three ways in a system optimized for most efficient usage. They're battery powered while on the road or boondocking. The same system will operate exclusively, or in tandem, on propane. When hooked to shore-power, A/C runs everything. Pumps onboard will give you line-pressure water anywhere you happen to be. AC/Propane gives you instant hot water. The generator will provide 50 amp service to provide power to the AC, water heater, and whatever other electrical devices you happen to bring.For cooking, a three-burner stove and oven make home-cooked meals onboard a welcome addition. Cookware, stoneware and cutlery is included in the rental. A microwave adds meals with a quickness. You'll also have a toaster and a quality coffee maker. Because we know what's important. The electronic package leaves nothing to be desired. There are plenty of GFCI 110v outlets to be found. Bedside, in the bathroom, living area, in the kitchen, and outdoors as well. An HD antenna will give you excellent service even when you're outside city limits! It’s complete with Bluetooth stereo, surround sound for the television, and a dvd player. You can choose where you want the sound - in the kitchen, living room, through the excellent outdoor speakers, or any combination. The living room TV removes from the wall mount with an easy motion and transfers quickly to a matching mount outside. Outside the unit, plenty of lighting is just where you want it. The exterior doors are screened, and covered under a 20', electrically retracting awning. There are outdoor power outlets, as well as a cable jack right next to the outdoor television mount. The unit is approximately 32’ long, and 11'9” in height. The vehicle is equipped with a brake controller for trailers so equipped. Full electric automatic levelling makes setup a BREEZE. ***Unlimited generator usage is included in the rental***Your rental will come with empty waste tanks, a full 50 gallons of drinkable fresh-water in the storage tank, and a topped off, 88lb propane tank for plenty of use time. Very open and spacious floor plan which allows for families to enjoy time spent inside. 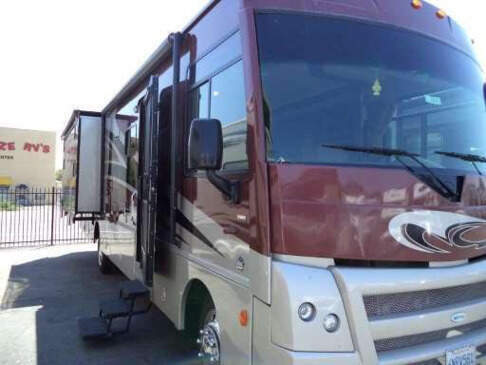 This RV has 4 TVs; 1 in the front, 1 in the master,each bunk has a fold down 8 in TV/ DVD combo with wireless headphones, and lastly there is an outdoor entertainment center that has the capability to set up a TV. This RV has 2 slideouts giving you that open and spacious feeling, 2 A/C units, satellite or antenna TV. It has a power awning and automatic leveling jacks. The Satellite will automatically find the satellite once you are stationary. It comes with an outdoor rug, 8 outdoor chairs, and some outdoor toys for kids. This RV comes with service for 8 in the kitchen( plates, bowls, cups, and utensils). Also comes with pots and pans, linens and towels. "Fabulous awesome camping /vacation machine"